October 11, 2012 – JESUP, GA– The Bone & Joint Institute of South Georgia hosted a Wayne County Chamber of Commerce Business After Hours on Thursday, October 4, 2012 to welcome Dr. and Mrs. J. Matthew Valosen to Wayne County. The event was a tremendous success with well over 100 attendees. After opening remarks from John Riddle, President and CEO of the Wayne County Chamber of Commerce, Dr. Lex Kenerly formally introduced Dr. Matthew Valosen to the audience. May 18, 2012 – JESUP, GA – The Bone & Joint Institute of South Georgia announces the addition of J. Matthew Valosen, MD to their staff. Valosen is an Orthopaedic Surgeon and will begin seeing patients June 1st. 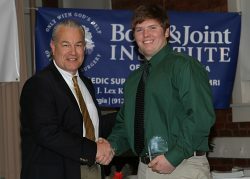 December 30, 2011 – JESUP, GA – The Bone and Joint Institute of South Georgia (BJISG) was honored to sponsor the Academic Player of the Year at In The Game Magazine’s 2nd Annual Southeast Georgia High School Football Awards Banquet held in Waycross on December 13th. The annual event recognizes players and coaches from Southeast Georgia Schools for achievement in athletics, and academics. It also recognizes one recipient each year with a Humanitarian Award. AUGUST 4, 2011 – ATLANTA, GA – The Bone & Joint Institute of South Georgia’s (BJISG) general contractor, Cork-Howard Construction, has been recognized by the Associated General Contractors of America (AGC), Georgia Branch, with a 2011 Build Georgia Award for their construction of the facility. The award was presented at the AGC’s annual convention in June. JULY 18, 2011 – JESUP, GA – Staff members of the Bone & Joint Institute of South Georgia participated in the Wayne County Exchange Club’s annual Golf Tournament on June 25th, helping to raise more than $11,000 for the prevention of child abuse. May 1, 2011 – Southeast Georgia – BJISG appeared in an article in the Spring 2011 Edition of Mature Living in Southeast Georgia. The article called “Innovation in Healing: Orthopedic Surgeon Establishes Unique Facility” by David Tootle tells the story of the talented Dr. Lex Kenerly and calls Bone and Joint Institute (BJI) of South Georgia an “innovative clinical and surgery center [that] offers patients the very best in facilities, technology, and care for their orthopedic problems, all under one roof.” An excerpt of the article can be found here. February 13, 2011 – The Bone and Joint Institute was proud to sponsor a table at the Fundraising Banquet for the Golden Isles chapter of the Fellowship of Christian Athletes. The event took place February 10th at the Grand Oaks Hall in the Jekyll Island historic district. April 7, 2011 – Jesup, Georgia – On April 4th, The Surgery Center at the Bone & Joint Institute of South Georgia earned The Joint Commission’s Gold Seal of Approval™ for accreditation by demonstrating compliance with The Joint Commission’s national standards for health care quality and safety in ambulatory care organizations. This accreditation means that The Surgery Center of BJI has been recognized for their dedication to continuous compliance with The Joint Commission’s state-of-the-art standards, and follows their receipt of accreditation in magnetic resonance imaging (MRI) from the American College of Radiology (ACR) in March. March 10, 2011 – Jesup, Georgia – The Bone and Joint Institute of South Georgia has been awarded the prestigious ACR Acreditation for its MRI facility as the result of a recent review by the American College of Radiology. MRI is the noninvasive medical test that utilizes magnetic fields to produce anatomical images of internal body parts to help physicians diagnose and treat medical conditions. December 13, 2010 – The 2010 IN THE GAME High School Sports Magazine® (Southeast Edition) Football Awards Banquet was held December 13th in Waycross, with coaches, players and parents from all of southeast Georgia in attendance.